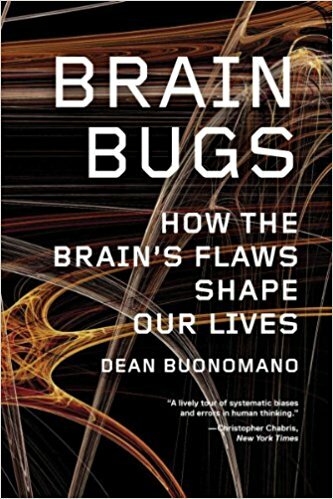 There are far too many popular science books around about emotions and pleasure and goodness knows what, so it might seem that the whole idea of writing about brain-related issues has got a bit tired… and then along comes Brain Bugs, which is an absolute delight to read and truly fascinating. 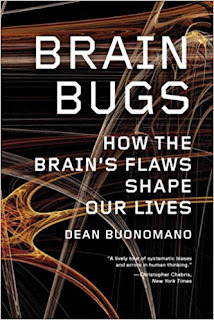 Dean Buonomano identifies the places where the brain gets it wrong, either because of technical problems – a classic example being optical illusions (there’s one of the best optical illusions I’ve seen in the book) – or because it was ‘programmed’ for life on the Savannah 100,000 years ago and doesn’t have a great fit with modern life. Along the way we’ll find things like memory (and why it gets things wrong), incorrect estimation of the rate of passing of time, fear, advertising, probability and the supernatural (Buonomano argues that religion is probably so strong for evolutionary reasons). I really enjoyed all the sections talking about the way our brains get into a pickle. The only downside is that when the author gets into the technical practicalities of what’s causing what in the brain it can all become just a bit too techie and detailed. I’m with Richard Feynman, who explaining a cat’s nervous system (I think), was told that biology students would have learned all the names for all the bits. No wonder, Feynman, said, it took them so long to get a biology degree. He thought there’s no point knowing all those labels – you can just look them up – and I’m inclined to agree. But this doesn’t take away from the fact that this is a brilliant book about the failings of your most important organ. They won’t kill you (usually) but they certainly will enthral you.